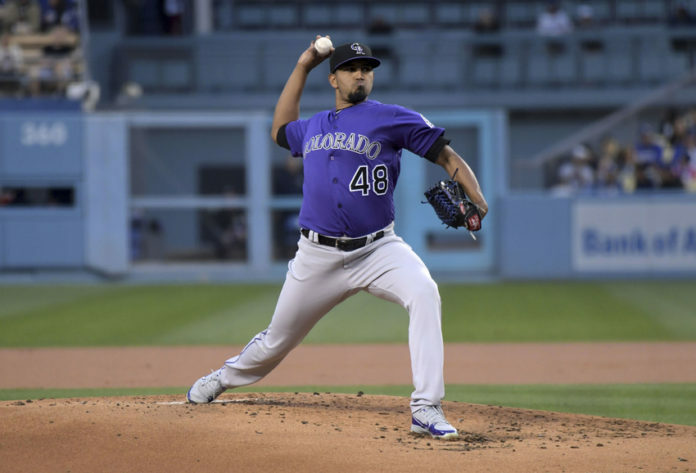 Playing for the first time this season, the Rockies and Dodgers faced off in a classic pitching duel Monday night. 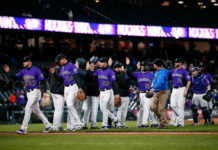 The Rockies were able to escape with a narrow 2-1 victory, rebounding after losing two straight games in San Fransisco to move back into first place in the division. Walker Buehler (Los Angeles) and German Marquez (Colorado) each were able to toss seven innings of one-run baseball for their clubs, battling each other pitch for pitch in the process. Each starter worked efficiently through the opposing lineup, consistently attacking the strike zone and avoiding putting themselves in harm’s way. Both teams were able to find their way on the scoreboard with a solo homerun apiece, but for the most part the starting pitchers kept things under control. Utility man Max Muncy homered for the Dodgers in the fourth inning and Gerardo Parra hit an opposite field home run in the fifth inning to tie the game at 1-1. Buehler finished with six strikeouts in seven innings, giving up only two hits in the start. Marquez was equally impressive, striking out five hitters in seven innings, giving up only two hits on the night. The start marks the first time in 2018 that Marquez made it past the sixth inning for manager Bud Black. After losing back-to-back starts, it was a good sign for the Rockies that the young pitcher was able to work deep into the game and consistently command the strike zone. It has been an up and down season for Marquez, but the second-year starter easily had his best performance of the season Monday and he was rewarded with a win. Once Marquez (3-5) was pulled in the eighth inning, Carlos Gonzalez was called to pinch hit for the Rockies starter with Tony Wolters on third base and two outs. Wolters had previously walked in the inning and got into scoring position by stealing second and then advanced to third on a throwing error by Dodgers catcher Yasmani Grandal. 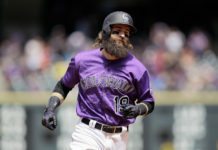 The successful steal was Colorado’s 14th straight this month and the aggressive baserunning paid off, as Gonzalez was able to bring Wolters home with an infield single for his 16th RBI of the season. With a slim one run lead (2-1), Black trusted the backend of the bull pen to shut things down and secure the always-important road victory. Adam Ottavino took care of things in the eighth inning, striking out Joc Pederson to lead off the inning and then getting out of a rare walk by getting Evan Turner to ground into a double play. Wade Davis then closed things out in the ninth inning, picking up his major league leading 17th save of the season. The Rockies (26-22) and Dodgers (20-27) will play game 2 of the three-game series Tuesday night. 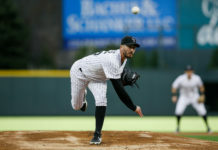 Chad Bettis (4-1) will take the mound for Colorado and will look to continue to build on the early success she has had this season. First pitch is scheduled for 8:10 PM.